McCoy is a company that has been featuring American made line since 1935. They embody the slogan, ‘Soft as silk, strong as steel’, which is exactly what they have developed with their polymer-reinforced spectra braid. The Super Spectra Braid uses polymer saturated spectra fibers to create a super strong and super tough premium line. By reinforcing the spectra fibers, McCoy claims that their braided line offers a greater resistance to breakdown and deterioration, UV exposure, and eliminates water absorption. Superior Knot and Tensile Strength: The braid is very flexible which makes knot tying easy. Hi Visibility Colors: The Super Spectra Braid is offered in Mean Green, Hi Vis Yellow, or Hi Vis Orange. Stronger and more Abrasion Resistant: McCoy boasts that their Super Spectra Braid is 15% stronger and 5x more abrasion resistant than similar diameter spectra lines. Completely Round Line: The construction of the perfectly round line is designed to eliminate reels clinching, rod tip wrapping, and air cast knotting. 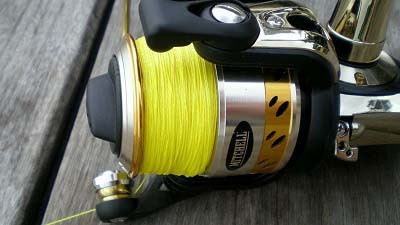 Optimal Casting Performance: The line is without a doubt smooth off the reel and quiet through the guides. Fishing the McCoy Super Spectra Braid felt very natural and loose. The line does not come with an ingrained stiffness as some braids do, which really does promote smoother casting. Knot tying was also simple and hassle-free, however, I would highly recommend using a fluorocarbon leader with the Hi-Vis line colors McCoy offers, as it will greatly increase the probability of a bass striking your bait. The colored braid really is great for line-watchers since the yellow line stands out so well against the Florida water. 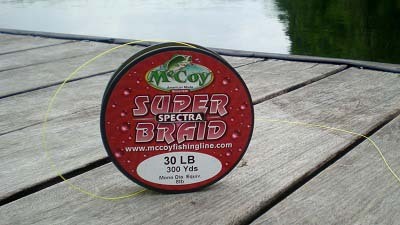 In fact, the only downside I came across while reviewing the McCoy Super Spectra Braid is the price. Listed below are some comparisons for the price per yard based on 300yd spools of braids in the same league as McCoy. While these price differences are not incredibly significant, we had to highlight the small drawbacks as McCoy really seems to have produced a very quality braid that just needs more exposure to become a standard line on your reel. The Super Spectra Braid from McCoy spools very well and it enjoyable to fish, which cannot be said for all braided lines. McCoy adheres to the typical braid diameter guidelines of a 30lb braid diameter being an 8lb mono diameter equivalent. While the longevity of the line color is yet to be determined, McCoy does not sell the average angler short with their Super Spectra Braid. They have provided a quality braid, and although it is set at a premium price, we feels most anglers would be willing to overlook this as the extra few dollars would be going to support a home-grown American product.